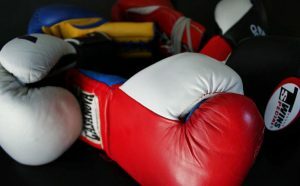 A guide for beginner boxers and a reminder for seasoned fighters on how to throw the most important punch in boxing. The jab is everything. It is the most basic punch and always the first punch you learn in boxing. The easiest punch to land and sets your opponent up to be hit by your bigger punches. When used defensively, the jab is a very fast counter-punch that can defend your from opponents’ punches and make room for you to get away. 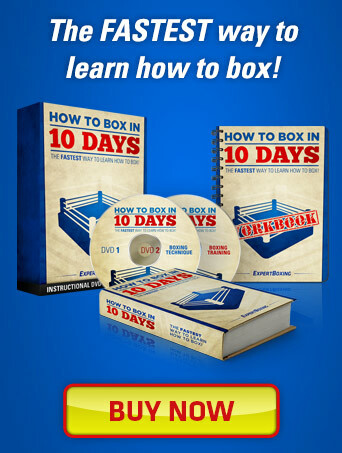 Read on to learn how to execute boxing’s most important punch! – THE JAB. 1. Stand in your basic boxing stance with your feet spread shoulder-width apart, knees slightly bent, chin down, hands up, and eyes on your opponent. 2. Take a small step forward with your front foot as you push you entire body forward with the lead foot. 4. As the you are throwing the jab, you are rotating the lead fist so that the palm is facing the ground by the time your jab hits your opponent. 5. Recover your lead fist back to your chin quickly by pulling the jab straight back. At the same time you are retracting your lead fist, you are sliding your BACK foot forwards so that your feet are shoulder width again. 6. When you are done throwing the jab, your body should be in the same position when you started with your feet back to shoulder-width apart and you are now a little closer to your opponent. Don’t telegraph the jab! The rest of your upper body stays still as you throw the jab. It is a simple motion and does not require you to move your right arm or over-rotate your upper body when you throw the jab. Keep your right hand by the chin the whole time. Don’t drop the right hand or else you’ll be easily countered by your opponent’s counter-jab or counter-lead hook. Remember to bend your knees. If you stand too straight up, you lose power on the jab and your body gets slightly off balanced making it easy for your opponent to counter-punch you. When you are jabbing your opponent, keep your chin down and aiming forward as you raise your lead shoulder high during the jab to cover the chin. Raising the lead shoulder to cover your chin will prevent your opponent from throwing an overhand punch over the jab into your face. If you don’t want to step in and you’re already in range, you can throw the jab from a stationary position without having to move your feet as you throw the jab. If you’ve done all this properly, congratulations! You have now thrown a proper boxing jab! 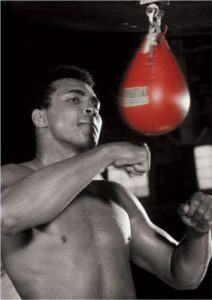 The jab can be used for offense, defense, counter-punching. It sets up all your big punches and is VERY VERY important! i started at a boxing club recently and they teach to keep the chin down behind the shoulder while jabbing for protection, but when im doing this im also kind of hitting myself with my shoulder when i throw the jab and after a while you can feel it in your head which cant be too healthy. I hope that helps. Let me know. Good luck with the jab! 😉 iv’e used this it works! @Ricky – Have you learned the step in jab? Stand 2 inches outside your opponent’s reach and take a SMALL step in as you throw the jab. Also try working the double jab (taking 2 steps in) to really close the gap. To throw the 1-2-1-2 without losing balance, make sure you’re not leaning forward. It helps to shadowbox more to improve your balance. You’ll know if you’re leaning forward when it takes you forever to pull your punches back. I’m currently unable to deliver two jabs quickly without them lacking power. When I do, they are too slow and would easily be countered in a sparring session. How do I get some speed into this type of punch without compromising power? Thanks. take a smaller step. and instead of focusing on shooting your arm out, work on stepping forward an inch. use that step to power your jab instead of your arm muscle. Thanks for the reply. I’ll try that. Excellent site by the way. when i throw a jab do i throw it with my hips as well as other punches? No you don’t. Keep your hips still. 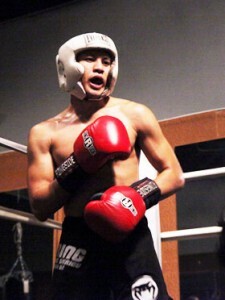 The jab is arm only and power is added only by stepping forward or slightly dropping the hips. Some guys will reach forward but I don’t recommend that. you dont recommend reaching forward due to falling off balance, and do i twist my upper body at all? Don’t twist your upper body. Leave it still and extend your front arm to jab. The jab is not a power punch. I know oscara de la hoya has a great jab. is he a good example on how to throw a proper jab? so a jab is not usually intended for power but rather to find your range, keep them off, set them up or even to distract them like when you recommend to throw for example cross, left hook, light left hook, cross. or am i mistaken sir? Exactly, a jab CAN have power but it’s main purpose is not for power. You can throw whatever combo you want but usually the jab comes first. My power hand is my right but I’m much more comfortable in a southpaw stance this helps my jab but I often find my left cross countered any tips on if I should try orthodox ? If you have problems keeping your chin down while you punch, check out this strap that you bite down on during your training http://www.fightlabgear.com It really works! What is your take on turning the lead foot in while throwing the jab? I have seen people doing this, but to me it seems to be too complicated movement if you have to do step forward as well. Also your balance is affected because you are only on your toe tips when turning the lead foot. But please tell me you perspective. I absolutely do not recommend turning the lead foot. It turns the punch into a left cross and that is not a jab at all. Jabs have forward momentum if anything, never any turn or pivots. Also if you pivot the front foot, you slow down your jab and your double-jab, and you might also inadvertently delay the speed at which your right hand comes out. If you need more power on the jab, work on your snapping technique.